Sometimes your baby may be bored being in the car seat or strollers. There are various baby car seat toys and stroller toys which are designed to entertain your babies while on travels or outdoors, so your baby can have fun anytime. 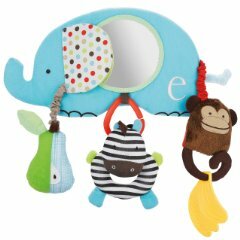 It comes with peek n’ see mirror, the bird rattle, crinkle bug, 2 clacker rings and it has satin ribbons and textured fabrics. This activity toy can wrap around the car seat handles and on the most strollers and cribs easily. It is made from BPA-free material. 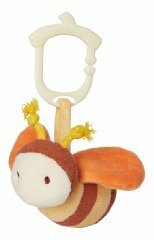 Spiral Activity Toy by Infantino features 4 delightful hanging toys. Your baby enjoys these toys on strollers and during bed time in the cribs. It features many toys such as spinning zebra roller ball which has various colorful beads and spinning paddle mirror. Its straps make it easy to attach to the infant carriers so your baby enjoys on travels. Take Along Carrier Toy Bar by Bright Starts has various toys attached to this toy bar including a cute tiger with melodies, the spinning paddle mirror and a zebra roller ball. Its batteries are long lasting and work for several months before changing. Its tiger’s nose lights up when music plays. The fabric used in it is 100 percent cotton and it also features flower mirror. It has easily reachable teether ring and its angled design makes it easy for baby of any stage to reach it. 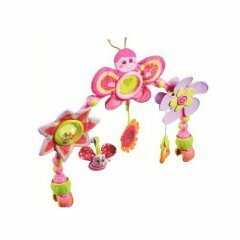 Stroll Princess Butterfly by Tiny Love has beautiful and lovely colors including pink, apple green and lavender. The flower mirror allows your babies to see themselves. Its arch design is easy to adjust which makes it easy for your baby to reach the toys. If your baby do not like travels, then this toy keeps them busy playing with it. It keeps the seat-belt in place and it lets your kids enjoy the travel. It has pockets so your kids can store their items in it and can take these pets with them. 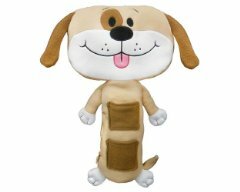 Tan Dog Car Seat Toy by Seat Pets is attached to the seat belt and your child feels comfortable in the car. Its 3 pockets are designed for their items such as MP3 players or anything. These are made from machine washable material and these measure 21 inches long. It is designed for 0 and above age. It promotes eight development activities for baby and its zebra toy is removable. Stroller Bar Activity Toy by Skip Hop can be used for travels and it is great for stroller bars or infant carrier handles as well. 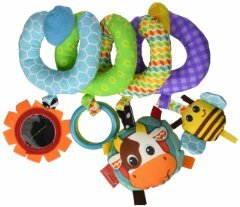 Its toys include rattle pear, the banana teether, and removable zebra toy and your baby can hold it. It also has a baby mirror so babies can recognize themselves. This toy promotes focus in your baby and its clacking rings awaken your baby’s auditory senses. It makes fun jingle sound which delights your baby and makes him/her happy. 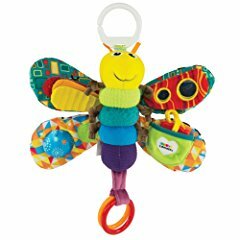 Freddie The Firefly by Lamaze keeps your baby busy for hours playing and feeling entertained. It makes beautiful clacking sounds and its lovely texture is designed to stimulate your baby’s senses. The pull-out teether soothes your baby’s gums when it is chewed. This robot has big and friendly eyes so your baby can focus on single object and it promotes healthy eye development for baby. Its floppy legs allows baby to pull and squeeze which promotes strong muscles in them. 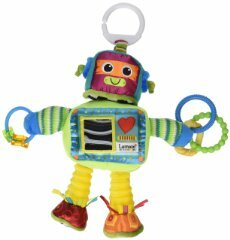 Tomy Lamaze Rusty the Robot Toy can be attached easily to carrier bar, diaper bag or strollers. It has different textures and when your baby squeezes its feet, these make sound. It has a discovery mirror and clanking rings as well. 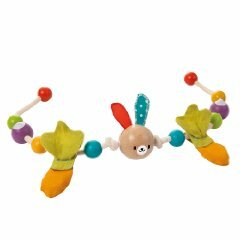 It features bold flying bugs which have rattles to get your baby’s attention and it can be attached to strollers and infant carriers. It has multiple fabric textures which lets your babies to explore with sense of touch also. 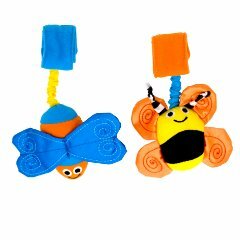 Bugs On Board by Sassy contains 2 flying bugs with rattles to entertain baby. The velcro straps make it easy to attach to baby carriers or strollers. These have multiple fabrics which baby would love and these have smiling faces. This toy’s ring can easily be attached to carriers, strollers, activity gyms and many other baby items. These are free of any harmful substances or toxic chemicals and are made safely. 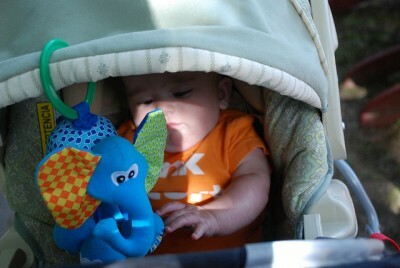 My Natural Clip n Go Stroller Toy is safely made and free of any harmful chemical or substances. It is made from soft cotton and it has bright colors and its ring makes it easy to attach anywhere you want. It is colorful stroller chain and it contains different textures. It is designed for baby with age zero to five months and it is made by using sustainable rubber wood. Plan Toys Baby Stroller Chain has different textures and your baby would enjoy looking at it. Its bell sounds are lovely for baby and it is made from rubber wood. It makes beautiful bell sounds when it shakes.